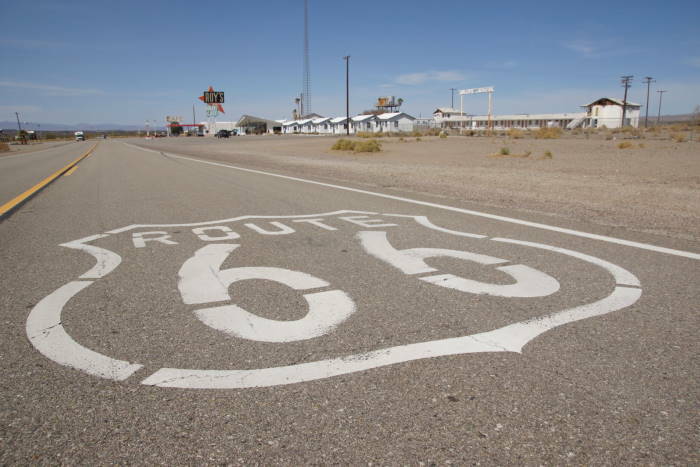 One of America’s newest national monuments protects an excellent stretch of the Mother Road – Route 66 across southern California. 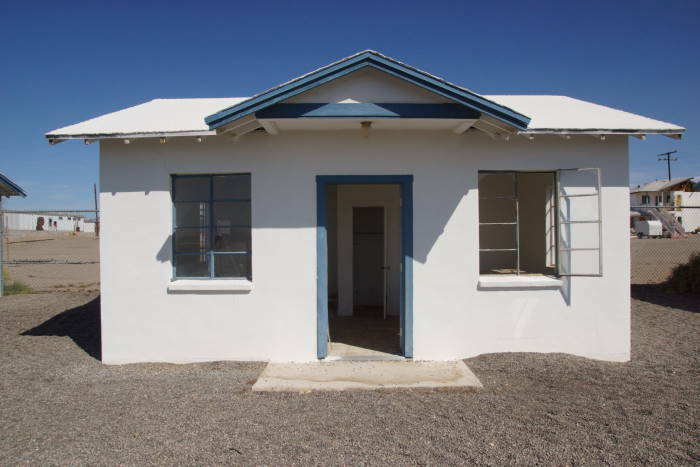 Mojave Trails National Monument was just added to the national parks in 2016, by order of President Obama. 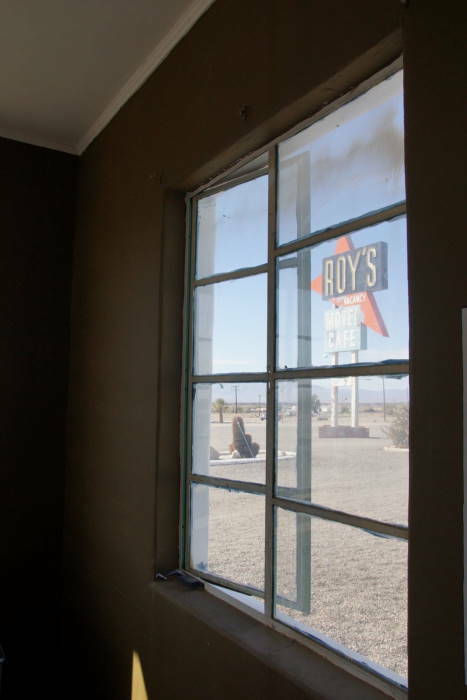 When you visit, you’ll enjoy roughly 70 miles of the original, lonely route — but your attention will likely focus on the tiny “town” of Amboy, California, and a place called Roy’s Motel & Cafe. 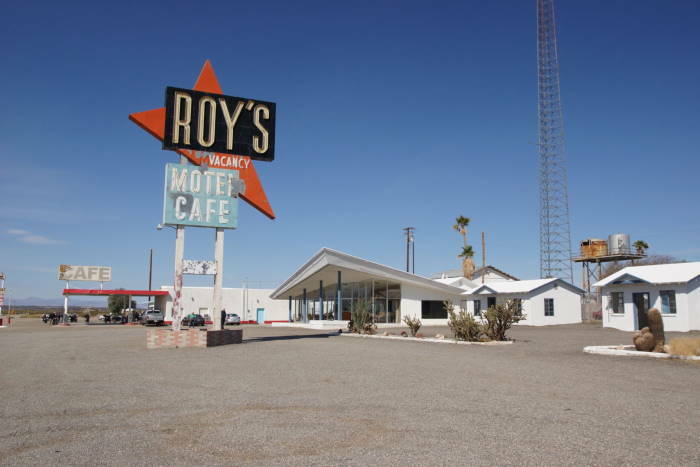 Amboy is located along old US 66 (now known as the National Trails Highway), south of Interstate 40. You can access the road from Ludlow or Fenner. If you’re coming from Twentynine Palms, take Amboy Road north. Dozens of miles of driving on old, bumpy, lumpy, semi-abandoned Route 66 pays off, when you see a giant red arrow on the horizon. The arrow points towards Roy’s, a once-thriving enterprise frozen in time. I had been here a couple of times before, in 2005 and 2007, but seeing that sign was just as exciting as the first time. When I visited in 2005, it was just before the town was purchased by Albert Okura, the owner of a southern California restaurant chain Juan Pollo. Okura promised to slowly restore the town — and slow is certainly the key word. 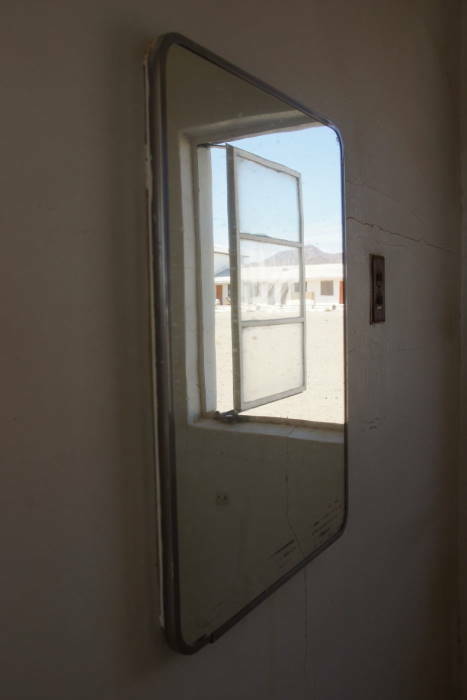 But, there are some interesting changes taking place in Amboy, and they are very encouraging signs that much more is on the way. … the gas pumps were pumping once again (albeit at $5 a gallon), and the cafe/store had a much bigger selection of items. 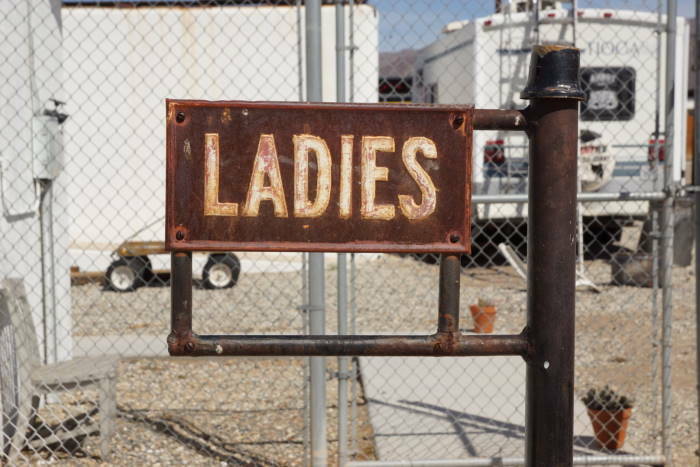 The restrooms were still pretty rough. While there are port-a-potties, I decided to give the flushable facilities a try. But, there wasn’t much flushing going on, and water barely trickled from the bathroom sink. 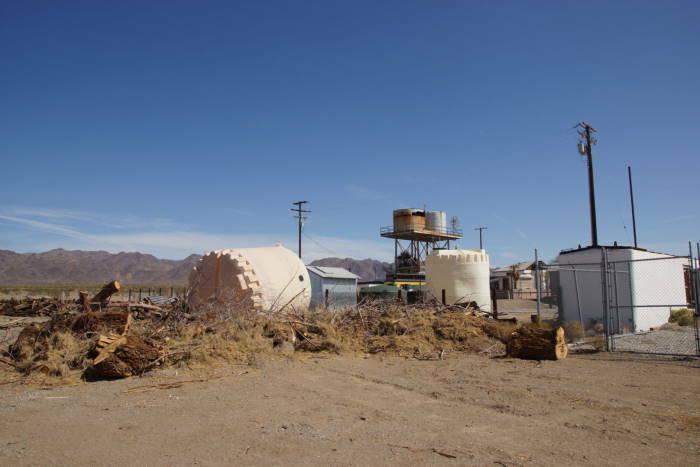 After all, the lack of water has been one of the biggest difficulties in keeping Amboy alive. The old motel cottages are probably the most interesting attraction right now. They have not been restored, but they have been opened to the public. 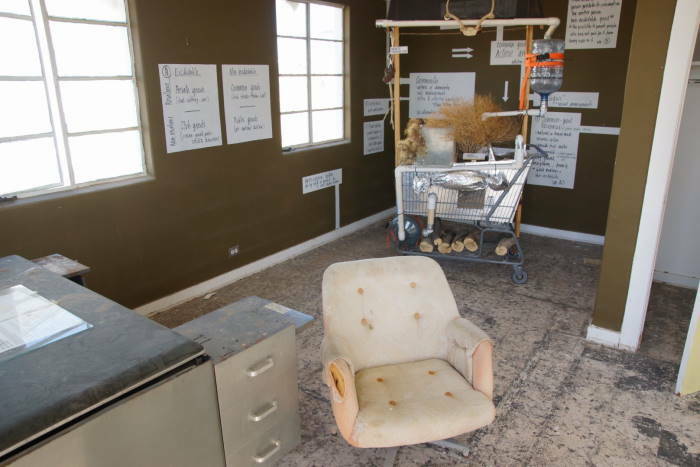 Artists from around the world have filled the cottages with varying sorts of sculptures or scientific displays on desert water usage. Let’s just say those aren’t bottles of Pepsi on the shelves. 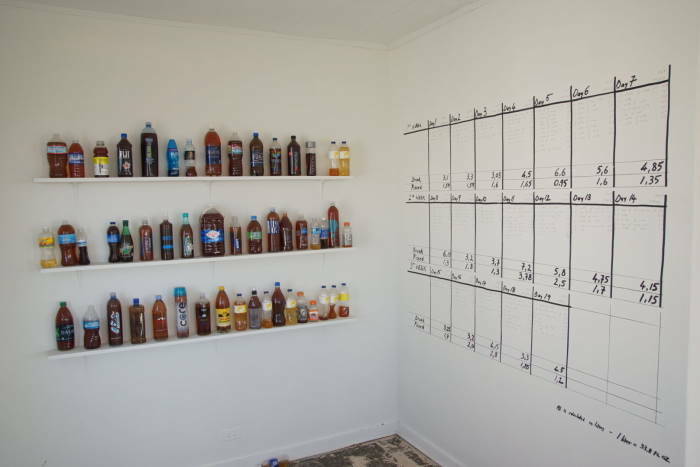 You could call them “processed” beverages. Processed by the artist. I think you know where I’m going with this. 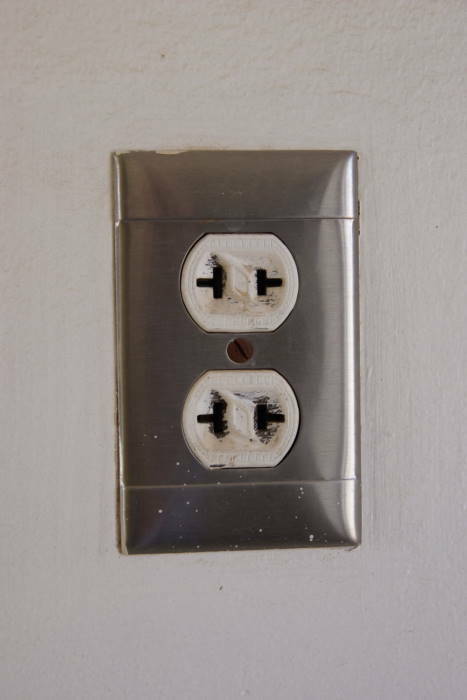 … along with ancient two-prong electrical outlets. I won’t show you what’s become of the old toilets. It’s not pretty. The old cottages provide some nice photo opportunities for capturing that brilliant old neon sign outside. Just imagine falling asleep here in the 1950’s, with that thing glowing outside your window. I found another neat improvement since my previous visit, in the old motel office — the glass-front, triangular-shaped building. 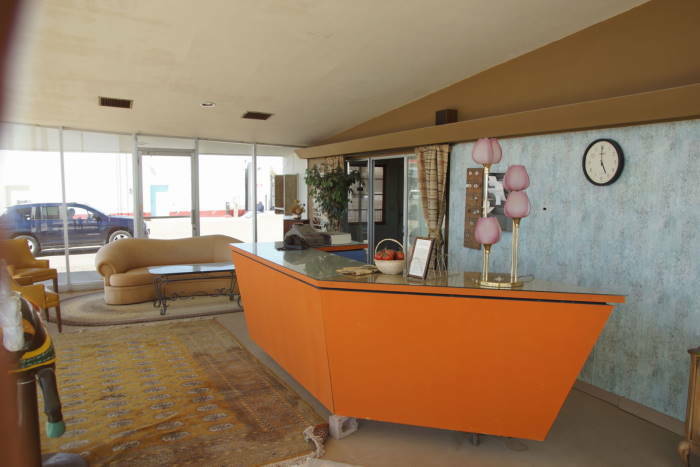 The lobby was filled with junk back then, but now, it’s been cleaned-out and restored to its 1960’s glory. Retro decorations and a rotary phone recreate — rather accurately, I’d guess — the funky feel of a typical mid-century motel lobby. The only problem is, you can’t walk inside. The doors are locked, so you must settle for enjoying this time capsule from the outside. While I visited, dozens of cars, motorcycles, and RVs pulled up to Roy’s. That’s a big change from a few years ago, and a positive sign that the business could make some kind of comeback — or at least be preserved for future generations. As for the rest of the town, it’s still pretty ghostly. 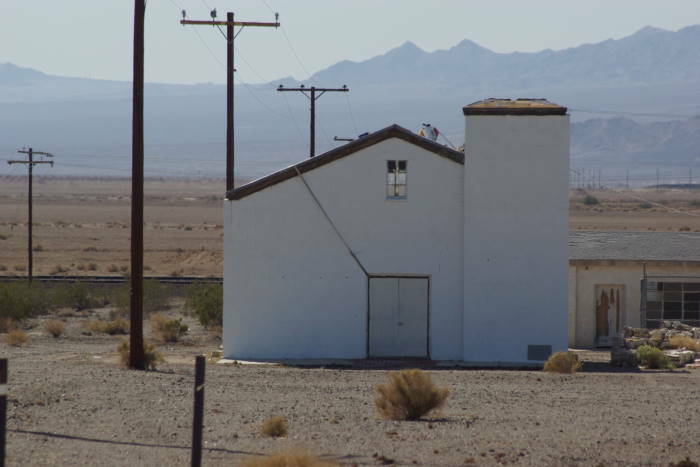 Back in 2005, I noticed the cross atop Amboy’s old church was leaning rather significantly. Now, it has fallen. 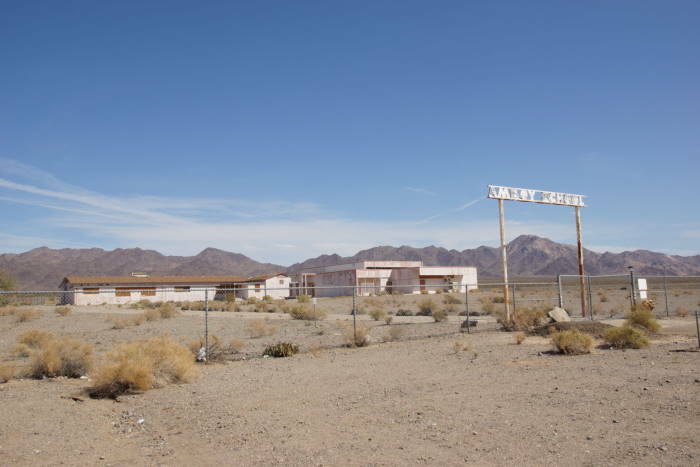 Amboy is located at the junction of Old 66 and Amboy Road – a north-south road that takes you down to Twentynine Palms and Joshua Tree National Park. On this trip, I didn’t have time to complete the loop back to Interstate 40. 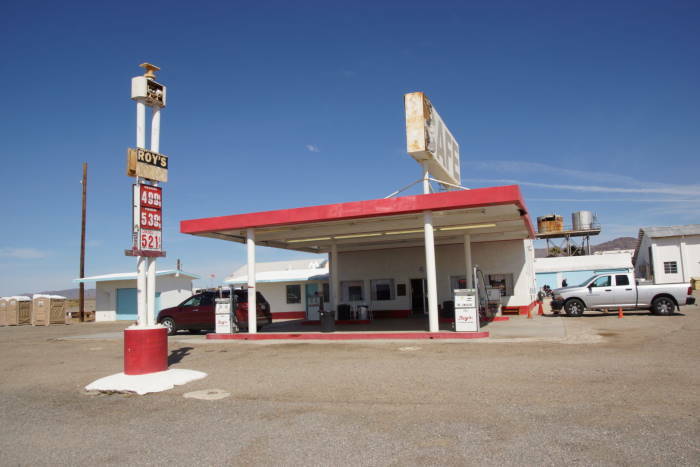 I needed to head south to Joshua Tree, so I skipped Arrowhead Junction, Goffs, and Essex — but you can still check them out on my 2007 trip. 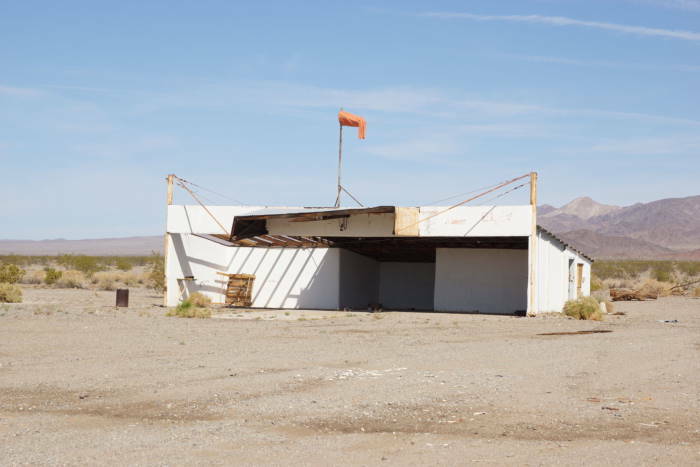 If you love the Mother Road, and you have fun wandering around old, vintage, and abandoned places, you’re going to love Amboy. See it before it changes. But don’t rush, it’s not changing fast.